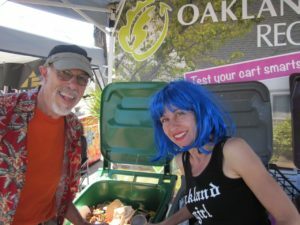 Darrell and Stef with the Oakland Recycles cart smart game. A very enjoyable aspect of our work here at Gigantic is that we often team up with artists who bring their creativity and skills to bear for environmental behavior change. Darrell built this food storage game for the StopFoodWaste event booth. Most recently, Darrell helped us build a game for StopWaste to help people learn the best way to store fruits and veggies, so they stay fresher longer and there’s less food waste. Looking a bit like a doll’s kitchen, the game lets players open cabinets and a fridge and peek under empty bowls sitting on the counter to find images of the foods they’re tasked to “store.” From tiny hinges to mini door handles and a sturdy collapsible stand for the game, Darrell helped us think through the design and put it all together. With such a unique skill set, it’s not a surprise Darrell is a regular at Burning Man, specifically a member of the Earth Guardians, Burning Man’s environmental crew. They are the ones in charge of enforcing the organization’s “Leave No Trace” (LNT) policy—essentially returning Black Rock Desert to its natural state each year, as if the weeklong, crazy circus of 70,000 revelers never happened. And it’s serious business, not an esoteric goal: LNT is a requirement written into the Special Event Permit and contract Burning Man has with Nevada’s Bureau of Land Management. For the Earth Guardians, this means recruiting, training and overseeing an army of volunteers who check on camps to make sure no gray water or automotive fluids are leaking on the desert floor, keeping people out of the hot springs, and collecting MOOP—or “Matter Out Of Place” as defined by Burning Man. This truly means anything that wasn’t originally part of Black Rock Desert, no matter how small, including beads and feathers broken loose from costumes, tiny litter pieces, wood chips and even the ash from cigarettes. To make the tedious un-MOOPing at least a bit more pleasant, volunteers get “MOOP bags” to collect the debris, sewn out of old jeans and ties months before the event by Darrell and his crew. But the Earth Guardians may already face another challenge: “Micro MOOP” such as body glitter and other particles that even the most diligent unMOOPing can’t retrieve. Lucky for Burners (and the rest of the world) Darrell is a master of reuse and waste prevention, and shares his skills and knowledge widely. At this year’s Burning Man, his repair workshop “Glue, screw, patch: How to fix things that break, are worn or want to be repurposed” was a huge hit. In his typical hands-on style, Darrell showed participants the best uses of glues, screws, splints and other repair tools, and fixed broken objects brought to the class. Way to go Darrell!